Fast One or Slow Number? The tempo of the song you pick is very important. 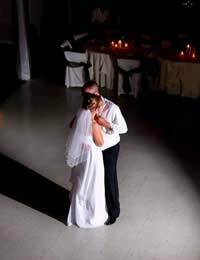 A really slow ballad (think Celine Dion or Whitney Houston in her soulful phase) is liable to bore the audience to tears before you’re halfway through, while a more up-tempo number can make it difficult to dance as a couple-particularly in a long bridal dress. Reject all your hard rock CDs and look through the middle-of-the-road stuff for something with an easy, swinging beat. It’s also less likely to bore the watchers if you pick a song they’ll all know as soon as the introduction starts. Classic jazz standards or Fifties Rat Pack swing numbers are a good bet, as they’re beloved of the older generation yet still familiar (thanks to the likes of Robbie Williams and Ray Quinn) to younger guests. How about Nat King Cole’s ‘Let There Be Love’ or the Cole Porter-penned ‘I Get A Kick Out Of You’ to get things started? Serious Side or Tongue in Cheek? Songs that reflect the ups and downs of a relationship are the perfect choice for a wedding – the culmination of a relationship that’s worked out for the best. Tunes such as Shania Twain’s ‘You’re Still the One’, ‘I’ll Stand By You’ by the Pretenders, or ‘Don’t Wanna Miss A Thing’ by Aerosmith are ideal choices that’ll have everyone reaching for the hankies. However, for those couples who think hearts and flowers are soppy and that Valentine’s Day gifts are a waste of money, dancing to a song full of romantic clichés can be a truly cringeworthy experience. Take a more ironic approach to your first dance and select a song with a jokey title. How About ‘What’s Love Got to Do With It?’ by Tina Turner, Elton John’s ‘I’m Still Standing’ or the Ronan Keating ballad ‘When You Say Nothing At All’ – the perfect song to stop your new wife nagging you! When the couple who recreated the iconic final routine from Dirty Dancing at their wedding put the video on YouTube, they surely can’t have known how popular it would prove. Learning a routine not only stops you looking out of your depth on the dance floor, it also means you’ve got a way of filling the entire song that won’t bore your guests. Take a couple of lessons from a professional ballroom instructor before the wedding. You’ll need to take along the shoes you’ll be wearing, and preferably a skirt that’s a similar length to your wedding dress. The instructor will help you work out a routine you can manage, both in terms of technique and the outfit you’ll be wearing. If you haven’t got any firm ideas about music, they’ll also be able to pick out a tune that’ll fit your steps perfectly. Finally, if you really can’t stomach the idea of getting up and dancing in front of everybody, force them to join you with a group dance. Banish any thoughts you’re harbouring of the Macarena or the Birdie Song – a ceilidh band or line-dancing caller will get everybody doing the steps for set dances. Take your partners for the Gay Gordons or Strip the Willow and have fun trying to follow the routines!